I always say that eating healthy doesn’t have to be expensive. Usually, I spend about $50-100 on groceries each month…just for myself. A couple of the meals are for others, especially cookies and baked goods I whip up. But overall, I don’t spend too much on groceries. So, I’m laying out my grocery budget for March. This past month, I set up a max budget of $75 and spent exactly $72 with more than enough of food for me. Although I did go on a trip for a week, I did pretty well and I have leftovers that will carry over for April. Everything was pretty balanced and I didn’t lack variety either. 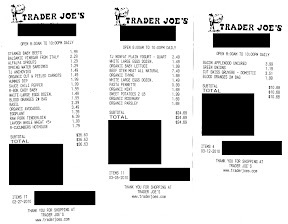 I added a copy of my receipts so you can see the kind of food I purchase and how much it cost. Click on the photo to view larger. Even though I write a grocery list and loosely plan my weekly meals, I could have shaved dollars off the final tally by shopping smarter. I didn’t need to buy stewed beef from New Zealand or a package of bacon when I already have a package of sausage in the freezer. I should go for frozen meat instead of the refrigerated version since most of it ends up in the freezer anyways. Plus, I could have sufficed with dried herbs instead of fresh organic ones. Since, I couldn’t figure out how to maximize their usage before they went bad, I made herb focaccia. If I did everything better, I could have saved over $10. Despite buying things under budget, I still faced the problem of spoilage. I lost 2 blood oranges, 1 cup of milk, 1/2 block gruyere cheese, and 1/2 package of mint due to mold and expired expiration dates. Hopefully next month will be better. I’m planning a max budget of $70, with a 5 day hiatus since my cousin is coming to visit. Yay for inexpensive healthy eating!